Live recording collects two performances in the U.K.! Live! 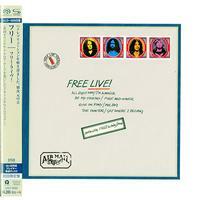 is a live album by English rock band Free. It was released by Island Records to commemorate the band, who had broken up in April 1971. Possibly because of the publicity caused by their breakup (which had also earned them a successful parting single "My Brother Jake" that same month) the album was a hit, reaching No. 4 on the U.K. album charts. The album was recorded from gigs played in the U.K. locations of Sunderland and Croydon, both places where Free had substantial followings, in January and September 1970. Engineer Andy Johns could only use two tracks from the Sunderland gig ("The Hunter" and "All Right Now"), but used crowd noise from it frequently to create seamless links between tracks. Many of the tracks on the album are from their debut Tons of Sobs, as that album's rock-oriented ethos and low production values made its material ideal for performing live. SHM-SACD format (fully compatible with standard SACD player, but it does not play on standard CD players) that enhances the audio-resolution. Japanese pressing. Housed in a 5 1/2" x 5 1/2" x 1/2" hinged-lid box which includes inside a full color mini insert LP jacket and booklet with English and Japanese lyrics. The obi surrounding the album replicates the one included in the Japanese first pressing LP.